The Undergraduate team from the College of William and Mary brought home an unprecedented tenth first place win in the National Tax Case Challenge. W&M Mason School of Business teams qualify for Deloitte Tax Challenge National Competition. The College of William and Mary continues to be regarded as one of the best in the country. The 54th annual William and Mary Tax Conference will be held Thursday and Friday, November 13-14, 2008, at the Conference Center of the Kingsmill Resort in Williamsburg. 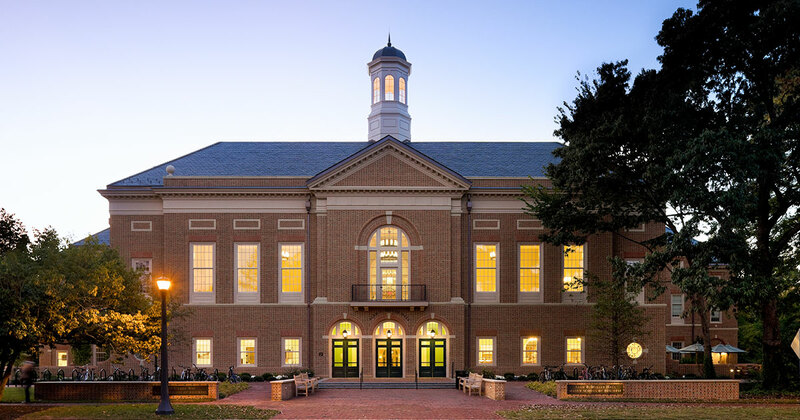 The Dominion Foundation has granted $350,000 to The Mason School of Business at the College of William and Mary to underwrite a 60-seat classroom in the School’s new building, Alan B. Miller Hall. Welcome Dr. Michael Luchs, Dr. Laura E. Simmons, Dr. Alex Woods, and L. Allen Slade, Ph.D.
W&M Professor Rama Ramamurthy has been incorporating modules about IFRS in her Professional Accounting III class (a required course in the MAcc program) for a year already. Experts in the field of finance -- including many successful College of William & Mary grads -- will gather for the second annual “From DOG Street to Wall Street Conference,” to be held Friday, Sept. 12. - John Strong, CSX Professor of Finance, has been appointed to a National Academy of Sciences Study Commission to examine prospective changes to the United States Postal Service (USPS). Research will focus on eCare, an initiative that employs information and advanced technologies to better meet healthcare needs and integrate environments of care. WILLIAMSBURG, VA -- The Mason School of Business at the College of William and Mary is pleased to welcome 11 new EPs to its Executive Partner Program. What the College of William & Mary Executive MBA program accomplished in just 11 days in Brazil and Argentina epitomizes what it can accomplish in nearly 20 months. Mason School of Business entrepreneurial students showed they had the know-how to start a business at the first ever Business Plan Competition. The Mason School of Business welcomed Hans Decker, former Vice Chairman of Siemens, as the third speaker in the Ethics Speaker Series on April 7, 2008. The Mason School of Business at the College of William and Mary presents the second Northrop Grumman Lecture on April 24, 2008, at 2 p.m. at The College of William and Mary in Blow Hall Room 332. The Mason School of Business at The College of William and Mary welcomes Phillip Horne as its new Executive Director of Development. Many of the country’s largest real estate developers converged on Williamsburg to discuss Developing Vertical Mixed-Use Projects. BusinessWeek ranking of undergraduate business programs places The College of William & Mary second among all U.S. business schools for marketing. What do you do after becoming a Commander in the Navy and accomplishing all your military career goals - retire? Not if you are a tech-savvy entrepreneur like George Bonsall, with multiple advanced degrees and loads of energy. Former Governor Mark Warner brought laughter and contemplation to an attentive audience at William & Mary on March 12. When the U.S. Navy came to The Mason School of Business to recruit for their Financial Management Associate Program, a new developmental training program for civilians, Eric Egger MBA ’07 took notice and signed up. William and Mary took top honors in the Alpha Kappa Psi Case Competition held February 22-24 in Atlanta, Georgia. On March 29, runners from all over Virginia will converge on Hampton Roads for the annual Yorktown Victory Run, organized by members of the Mason School of Business MBA Association. The TIAA-CREF Institute has selected Julie Agnew, assistant professor of economics and finance at The Mason School of Business at The College of William and Mary, for its Fellows Program. Professor Rajiv Kohli, associate professor of Management Information Systems at The Mason School of Business at The College of William & Mary, has been named Visiting Scholar at the MIT Sloan School of Management Center for Information Systems Research (CISR) for Summer 2008. The Financial Times ranked The Mason School of Business at The College of William and Mary among the top 100 MBA schools in the world in its recent international ranking of business schools. The Mason School improved its overall ranking, climbing eight positions to 71st in the world. Cargo operations in the port of Hampton Roads delivered a powerful economic boost to Virginia in the fiscal year ending June 30, 2006, according to a study released Tuesday by the Virginia Port Authority at its Board of Commissioners meeting. The former Marine helicopter pilot is entering the world of finance and business after serving in Iraq and Afghanistan, and he credits his William and Mary experience for helping him get there.